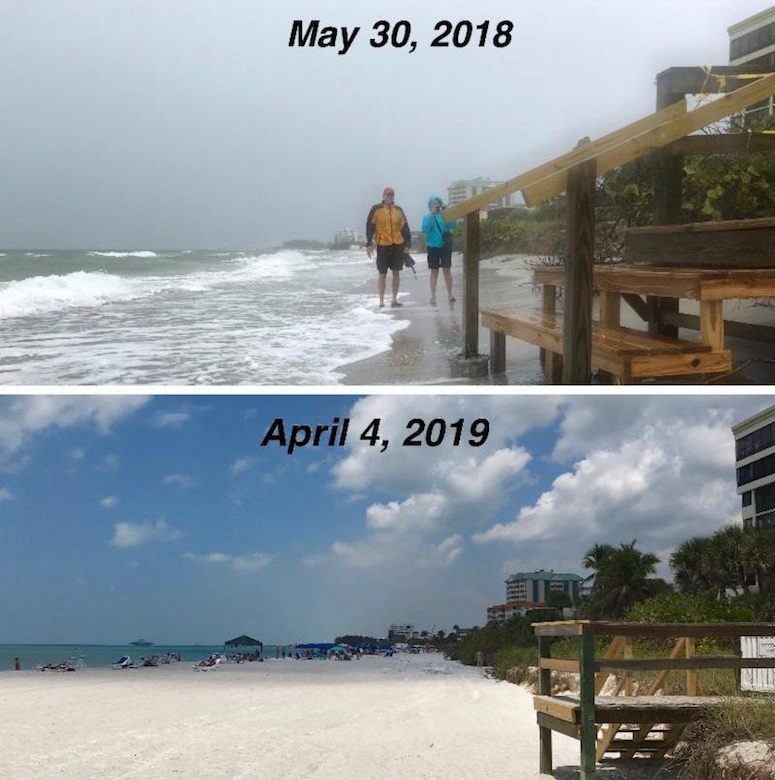 The Lido Beach emergency renourishment project was close to completion by the end of last week, Sarasota City Manager Tom Barwin reported in his April 5 newsletter. “The protective sand and beautiful white beach has returned to Lido Key!” he wrote. “The contractors had finished the dredging portion of the project,” he noted, “recycling approximately 205,000 cubic yards of sand accretions” from New Pass. The sand was placed on the beach from the Lido Pavilion south to Ted Sperling Park, covering slightly more than 1 mile, he wrote. “For the next several days, you may see crews on the beach taking measurements and putting the finishing touches on the project, including tilling sand to prepare for turtle nesting season,” Barwin noted. Although the project began in November 2018, Barwin has explained that high seas associated with cold fronts kept the dredge at a standstill from time to time, including the period immediately after the early November 2018 staging of the equipment at the beach. “City Engineer Alex Davis Shaw, who shepherded this renourishment project and many others over the years, says when this emergency project started, the condition of Lido Beach was the worst she had seen in 30 years,” Barwin pointed out. “It’s a relief knowing we will go into hurricane season with an added layer of protection from the pounding surf,” he wrote. Based on documents the City Commission reviewed in advance of approving associated budget amendments on March 18, the emergency initiative will cost about $3.9 million. The Federal Emergency Management Agency (FEMA) awarded the city $722,229 for the project in response to damage Hurricane Irma inflicted on the shoreline in September 2017. Another $120,372 in State Emergency Response Team (SERT) funding was for Irma damage, too. However, both a 12th Judicial Circuit Court case in Sarasota and a federal court case have been filed to try to prevent the removal of sand from Big Sarasota Pass for the long-term project. Although the U.S. Army Corps of Engineers stands by the validity of the modeling it undertook for its 50-year Lido stabilization proposal, nonprofit organizations on Siesta Key contend that any dredging of sand from Big Pass and the pass’ ebb shoal will lead to negative consequences for Siesta Key property owners.